Prontobar is the latest and greatest super automatic machine Nuova Simonelli has to offer. Perfect for those in the market sector who are in need of a high quality yet simple to use machine. Prontobar can be tailored to suit your needs, as it is available with either a direct connection to water mains or with a tank, as well as either one or two grinders. 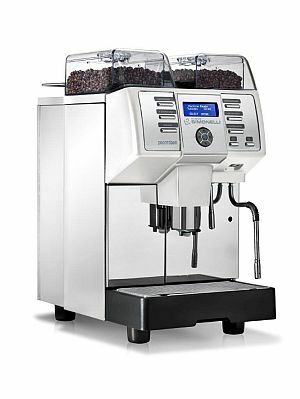 The Pronto Automatic Coffee Machine Plumbed Version features all the characteristics of a professional espresso machine in its compact 33cm wide frame. The most flexible machine of its kind, be able to choose from a wide selection of drinks and water source for the machine. The new and improved delivery coffee group comes standard with completely updated mechanics and electronic temperature compensation to ensure every drink is of the highest quality, and that the machine can out-stand many years of use. Enjoy the peace and quiet with the silent grinder unit. The Nuova Simonelli Pronto Automatic Coffee Machine also features new internal components and groups to produce consistently high-quality coffees while still being easy to maintain. All internal and external components have a modular design, saving you time and effort on machine maintenance.